Last night, the Pirate and I opened a bottle of red wine after dinner. We were still drinking the wine when we retired to the bedroom to get ready for bed. The Pirate brushed his teeth before he’d finished his wine, and when he came back into the room and took a sip, he made a weird face. “That’s interesting. After brushing my teeth, this wine tastes like…chocolate…and cheese….” He was doing that thing people do when they’re trying to describe a taste or sensation they’re experiencing: looking around in the air above his head as though the answer were on one of the hundreds of postcards attached to the ceiling. I started collecting these in college, and still pick up a few whenever I go someplace cool. 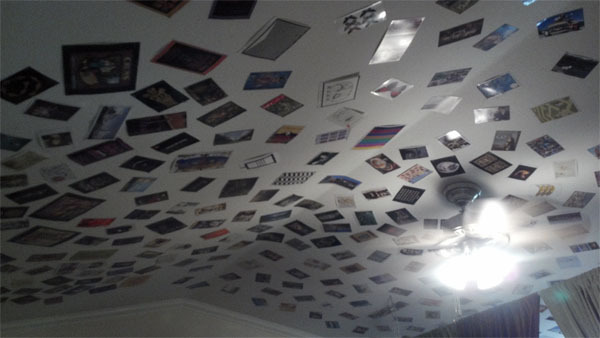 If you sent me one, I’d put it up and think of you when I looked at it. He wanted me to taste it after brushing my teeth, but I declined. I feel certain that if I had done the experiment, I wouldn’t have tasted chocolate OR cheese, and it led me to wonder – when I eat chocolate, do I taste the same thing my husband tastes? Or that you taste? I know that when I drive past a skunk that was hit by a car, the skunk smell is exactly the same to me as the smell of roasting coffee, and yet I know people who say that the smell of roasting coffee is pleasing to them, but the smell of skunk is disgusting – how can they make a distinction between them? To me, they’re identical. People can distinguish five different tastes: sweet, bitter, salty, sour and umami. In addition, they can distinguish seven different types of smell: musky (the smell of perfume), putrid (rotten eggs), pungeant (vinegar), camphoraceous (moth balls), ethereal (dry cleaning fluid), floral (roses) and mint. Here’s what I’m not sure about: a given food contains a set of chemicals that make up its flavor profile. Every eater of a given food is working with the same set of chemical inputs. Why, then, the differences in perception? Is it a difference in body chemistry? Is it a difference in brain wiring? Both? How much does our sense of taste play into our food and drink addictions? A Google search of the words “fast food addiction” shows 16.6 million results, including studies that show the addictive properties of fast food. Those addictive properties are tangentially related to taste in that the pleasing taste activates the brain’s pleasure centers – one article outlines the addictive ingredients in fast food including monosodium glutamate (a prime component of the “umami” taste) and casein, a naturally-occurring protein that, in fast food, is pumped up to past the danger point. I’m not addicted to fast food. I can’t afford to be, since I’ve been battling a weight problem all my life. My husband, on the other hand, is naturally thin and has no real fondness for the things I have the most trouble with – baked sweets, chocolate, cheese. It feels unfair to me that because of an accident of chemistry my husband can maintain a healthy weight despite eating an enormous amount (I know, part of it is that he’s a man and therefore has more muscle mass and a higher metabolism, in addition to the fact that the man is two meters tall and therefore has a lot of guy to feed) while I have to consider every bite that goes into my mouth. On the other hand, I also like to think that it means that I have outlets for enjoyment that are closed to my husband, who doesn’t equate the taste of white jasmine tea with love, or the flavor of Ezekiel bread with independence. In that way, I’m the lucky one. This morning, we had the first “character” breakfast on board – that’s where all the Disney characters show up and sign autographs and pose for pictures. While most of the waitstaff was busy bringing us our food, some of them were there solely to fold the napkins into entertaining shapes and put them on people’s heads. Most of the women received enormous bows. 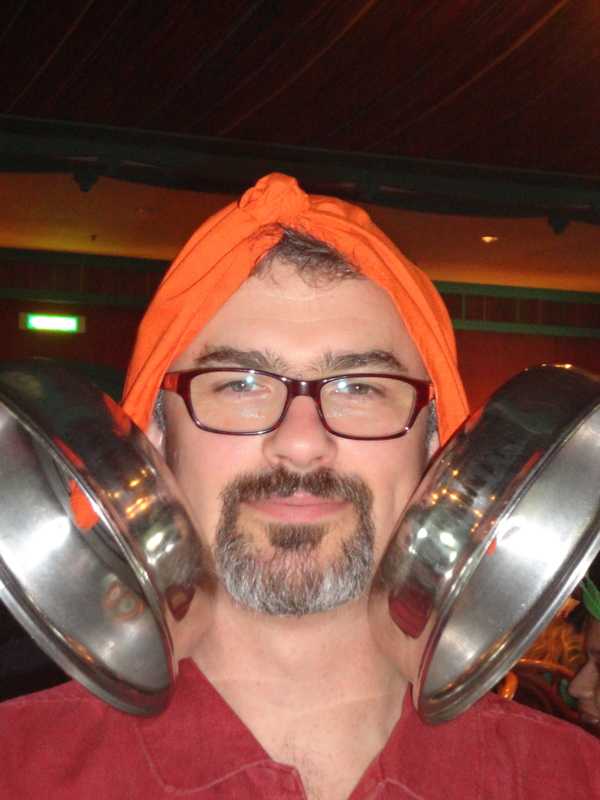 Some of the men got Robin Hood caps, but some of them got what looked like a bandana holding up earrings made from dish covers. Or teacups. Or milk jugs. I told the Pirate that not only was I going to take a picture of him in his lovely gear plate-cover earrings (they made him look like a Jamaican robot Princess Leia), but that he had to make it his new LinkedIn profile picture. He’s been married long enough that he just smiled and nodded. While I was in the bathroom this morning, I realized something. While I washing my face and brushing my teeth, I realized that every so often I would feel like the mirror was a little further away than it just had been. Then, a second or two later, I would feel like I was going to fall forward into the mirror. It was very subtle, but it was the first time I could really feel the motion of the ship. As we walked down to breakfast, I realized that I still felt a little dizzy. Just a little, and mostly whenever I looked out a porthole at the passing ocean. It feels pleasantly disorienting and encourages me to breathe deeply. After breakfast, we hit the bingo game where I ordered a drink called an “eco-tini.” It had acai berry, agave nectar, ginger, leaves, bugs…you get the picture. It came with a little bracelet of acai berry seeds. I put it on, and what it really looks like is my alcohol friendship bracelet. I hope that gin doesn’t get jealous. I’m sure this will just be a shipboard romance for me. I want to go on and on about the experience of being on a boat, but it’s like any large-ish touristy building. Most of the space is taken up either by rooms or by boring things like utility cupboards and big bits of weirdly shaped metal with seventy million coats of paint on them. Once you’ve been through every single thing in the two shops, poked your head into all four of the bars and been to all of the restaurants, there’s not a lot to see. I did spend some of every day we were at sea in the gym, and I can tell you that it’s really hard to get a good head of steam on the treadmill when the ship is really pitching. So, the only other thing left is to spend a lot of time out by the pool, sunning yourself and fending off the advances of the seventy-four waiters hawking beverages. To be honest, I wasn’t always very successful at fending them off. To be even more honest, sometimes I didn’t even try. In the 1940 classic “The Philadelphia Story,” C.K. Dexter Haven tells Macaulay Connor “I thought all writers drank to excess and beat their wives. You know, at one time I secretly wanted to be a writer.” He tells Macaulay that Tracy Lord never understood his “deep and gorgeous thirst.” I’ve always thought that writing and substance abuse go together. Hunter S. Thompson, Raymond Chandler, John Cheever, O. Henry, Tennessee Williams, Dorothy Parker, Edgar Allen Poe, Ernest Hemingway – all famous literary alcoholics. Baudeliare smoked hash, Stephen King did coke, Aldous Huxley did mushrooms – the list goes on and on. I think it might be more difficult to find a successful writer who hadn’t at some time abused something. Sadly, I’m not a drug addict. I don’t have the personality for it. I can’t stand the thought of regularly using something so expensive. I’m just too cheap. On the other hand…there’s always liquor. I was at dinner with a couple of friends last week, and the drinks menu featured a couple of cocktails whose names I hadn’t heard except in novels in years and years. Singapore Sling, Manhattan, Harvey Wallbanger, Old Fashioned, Cuba Libre…I started feeling like I should be wearing a satin gown and maribou-feather slippers, making sure that I didn’t smudge my lipstick or muss my marcelled hair. I had a couple of Singapore Slings and suddenly, I was Katharine Hepburn, Carole Lombard and Bette Davis all rolled up in one (seriously – they were tiny women and have you seen me?). If I had been at a typewriter (or, more correctly, if I had been a typewriter sitting at my machine), I would have been churning out the kind of prose that made people laugh on the bus, cry in restaurants and call up their friends just to read extensive passages. I’ll tell you a secret, though. When I was 18 or 19, before they raised the drinking age in Arizona to 21, my boyfriend and I would walk to this Italian restaurant a mile or so from my house and split a plate of pasta and a bottle of bad chianti. I didn’t know it was bad chianti at the time, but I was young and stupid then. We would get drunk and, in that pretentious way that only 18 or 19 year olds can pull off, talked about deep, philosophical truths. We talked about world politics and art and the nature of reality. We talked about popular culture, the human condition and how we were going to change the world with art. These discussions were monumental. They were profound. They were so important, I felt, that I persuaded my boyfriend to bring his new mini tape recorder to dinner one evening so that we could actually remember one of these conversations the next morning. That night, we drank two bottles of bad chianti and ate spaghetti with butter and mizithra cheese. We probed the very depths of the deepest questions mankind has asked himself since the invention of language. We revealed ourselves as the gods of our own private universe, a place much more orderly, beautiful and just than the one that everyone else seemed to inhabit. We weren’t golden children, we were beings of diamond. The next morning, after throwing up, we listened to the tape. It was hard because the night before, we had apparently had some difficulty working the tape player. You know, pushing both the “play” and the “record” button at the same time. There was a great deal of giggling, some of that “I love you, no I love you” crap that couples at a certain stage of their relationship think is terribly charming, and a whole lot of incomprehensible mumbling punctuated with belches. When we did speak, we seemed only to be able to complete one sentence in four, and that one generally ended with a loud “HA!” The two of us looked at each other, mortified, and vowed never to do that again. My loving husband is mixing me a cocktail even as we speak, but I’ll likely sip it slowly and perhaps not finish it, for I’m in the midst of Nanowrimo, and I’d like the words I put together to mean something.